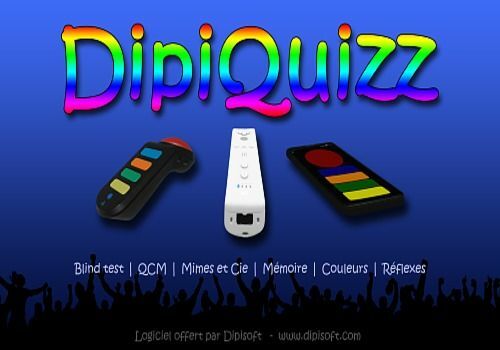 DipiQuizz is a game, or rather an application that is intended to offer games to liven up your evenings with family or friends. But the program will also work in the afternoon or morning if you want! a "blind test" activity. For those who are not told, this is a game where participants have to guess the title and/or performer of a piece of music. Of course, you can use this feature to make people guess something other than music. Personally, I've put together thematic playlists (generics of cartoons, series, broadcasts, film music or even cult replicas from films) and it's really fun! a "qcm" activity, which will allow you to question your guests on different themes. The app comes with about twenty questionnaires but you can create your own very easily. a "mime and cie" activity, the principle of which is that one of the team members must make his team members guess (by mime, definition, drawing or other) the most elements in a limited time. The elements to be guessed, which appear on the screen, come from thematic files. There are about ten of them provided with the app but you can also create your own or enrich existing files. a "memory" activity, which takes up the principle of the well-known "Simon". Players will have to reproduce a sequence of notes/colours. a "reflex" activity, where players will also have to press the button corresponding to the displayed color, but this time the speed increases during the event. To make the game more fun, the app uses "controllers" or "electronic voting boxes": wiimotes (Wii console controllers), buzzers (PS2 wired or PS3 wireless) and smartphones are supported. There is even a special "keyboard test" mode for those who do not have any of the above-mentioned devices. To use the app with smartphones, regardless of the brand since you are only using the web browser. No need to install an app except a QrCode reader to make it easier for players to connect. No need for an internet connection either: smartphones connect to the PC via wifi. And if there is no wifi in the room, no problem, I have thought of everything since I have integrated a feature to create a wifi access point! A complete user manual is provided. It begins with a description of the prerequisites and then accompanies the user in installing the "controllers", before describing all the elements of the interface and the functionalities of the application. DipiQuizz is portable, it is delivered as an archive (be careful, the size is significant: nearly 100MB!) and not as an installer. Although "portable", the presence of the Framework .NET 4.52 (minimum) is still required. Depending on the user feedback it is not excluded that I may sooner or later offer an "installer" version. It is very easy to add your own playlists (for the blind test), questionnaires (for the qcm) and dictionaries (for "mimes et cie."), for this I invite you to consult the manual. Warning: some antivirus software reacts to downloading this tool, announcing a threat (variant of "MSIL/Packed.Confuser.N"). This is related to the fact that the app is "obfuscated" so as not to allow its decompilation. A method also used by virus creators, unfortunately. Needless to say, I am aware of this, I certify that all my products are healthy, so either you trust me or you will have to do without this tool. Hearing Test Base is a software to store and print listening tests for Audio-Psycho-Phonology (APP). Quality and professional impressions for listening tests. 10 questions are asked with a minimum of time to answer them if not lost! A key will be provided to access level two. Have software designed with psychologists to manage your patients (administrative information, accounting, session notes, appointments). Use VisualCab to perform psychological tests on your patients. A useful tool that not only shows you how your life is balanced, but also helps you to make it more harmonious. This small program allows you to identify your difficulties in this area and thus improve yourself.